to the offical website of A.W.A.S. Straight forward deathmetal out of Bonn, Germany. since the last update here. There will be some changes to this 'old' website. We unfortunately had to kill the old guestbook because of spam, so if you wnat too get in contact write an email. We also hope to present you some new sounds soon. 1. We are still working on some new songs for the next full lenth release. 2. "Open grave records" is no more! So if any rec-label is interested in our band, don't hesitate to contact us, to get an impression of our latest sounds! There are some new photos from our show in Bonn - 01.Feb. '08 online in the "pics" section now. Thanx to everyone who supported us at this gig! It may take some time until the next shows, because we are currently working on new songs for our next release. 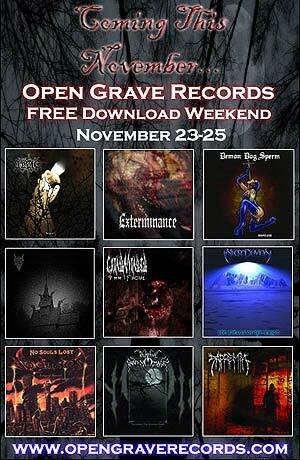 Open Grave Records Free Download! New pics from our show in Köln are online now! Thanx to Andreas Dyck ffor the awesome work again. Thanx also to the other bands Debt Of Nature and noizwyrm. Leider findet das angekündigte Konzert in der werk°stadt-witten wohl nicht statt. Warum, welshalb, wissen wir auch nicht. Haben leider trotz Nachfragen nie eine Rückmeldung vom Veranstalter bekommen und wissen leider bis Heute absolut nix. Daher gehen wir davon aus das das Ding geplatzt ist. New Gitly-shirts are available now! Thanx to the whole Metalfest crew and all the great bands, like Essence of Sorrow, Seventh Avenue and Immortal Souls we had the pleasure to play and to hang out with. There is a little live review(D) in the press section. War ne super coole Zeit beim Hardrock Halleluha im hohen Norden. Auf diesem wege noch mal DANKE an all die Organisatoren und allen die uns dort so freundlich aufgenommen haben. Nicht zuletzt dan all die Leuz die bei unserem Gig waren und uns tartkräftig unterstützt haben. Eckernförde Rocks! Einen Videoclip vom gig gibts auf unser Myspace site. Außerdem noch ein DANKESCHÖN an alle die uns gestern im Nyx waren und spaß hatten. 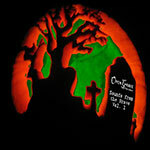 is a FREE 12 track downloadable sampler from Open Grave Records. Please feel free to download and distribute freely as you see fit. Download the whole sampler for free!! New Kekal material, Feast Eternal, Downloard and many more. Also, pictures of the release party are online. Check the pics section to view the photos. Yes, the re-release party rocked! Dickes Danke an Invoid. und den Cribbel!! Pics of the show will be added soon. Also the album arrived; "hope" is OUT NOW! ask for price an shipping or get it from OpenGraveRecords. The new A.W.A.S. T-shirts are available now! Check the new "Goods" section for more info. Although the release date for stores of "hope" was deferred to April 3rd 2007, "hope" is ready to get ordered directly from Open Grave Records now! Just click to button below! First the good one: We are working on new band-shirts. We wish a merry Christmas and a blessed new-year 2007! Thanks to everyone who has supported us last year! And... hope can be pre-ordered from Open Grave Records now! 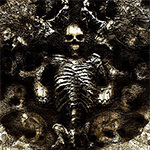 "Sounds from the grave" the new Open Grave sampler, including our song "damned to death", is out! You can download it for FREE by clicking the image. Enjoy! 2. The Open Grave release date of "Hope" will be February 27th 2007! WE HAVE SIGNED TO Open Grave Records!! ...so our debut album Hope will be re-released by Open Grave in late 2006 or early 2007! We only will no longer be called "acoustic war against satan" but "ardent war against satan". We did that because often the "acoustic" part got misunderstood. Some people thought we were playing acoustic guitar music, which we definitely don't. And on the other hand "ardent" even sounds cooler! The next graet news will come soon! New website is online, as you can see ;-), but unfortunately it isn't finished jet. So please be patient; other updates will come soon. GOOD NEWS: "hope" our first full lenth CD is out now. Special thanx regarding to the CD to: Stafan and Balticsound, Tobi and Whirlwind, Ruben for drum-hardware, Robby for the soundcard, Andreas for the photos and all the others who have supported us in the past, or still do.